“Alwych Notebooks have been a firm favourite for more years than we care to remember. Everything about Alwych is special, from the strong flexible ‘All Weather’ cover, to the section-sewn opaque pages. They are constructed to keep your notes safe. I personally have not tried this notebook (you can find a great review on Black Cover if you want more information). I’m not an outdoor person and and all-weather notebook has not become a must-have notebook – the worst experience I have had is getting my notebooks a bit damp and I have certainly not lost a notebook to scottish weather. Have you tried an all-weather notebook? Alwych or otherwise? If you don’t have – you ever needed to? I collect notebooks for my writing, but I’ve never tried Alwych notebooks. I have never heard of this particular notebook.I have more notebooks then I care to admit. There is just something about starting with a fresh journal! 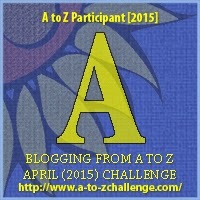 Glad to meet you through the A to Z Challenge! Nope, never tried an all-weather notebook. But I’m not much of an outdoors writer. I have never even heard of this type of notebook. Guess I didn’t realize there was a need for one. Happy to have learned something today! The fun thing about notebooks is that it is all about how you use them – that is why even though notebooks have been around for years – we still always come up with something new. this sounds like a good notebook for me to have! Lots of garden notes could fit in there..
Hadn’t though of using it for a garden notebook – that sounds perfect.